Stephan Hogan was born and raised in the shadow of The Big House right here in Ann Arbor. 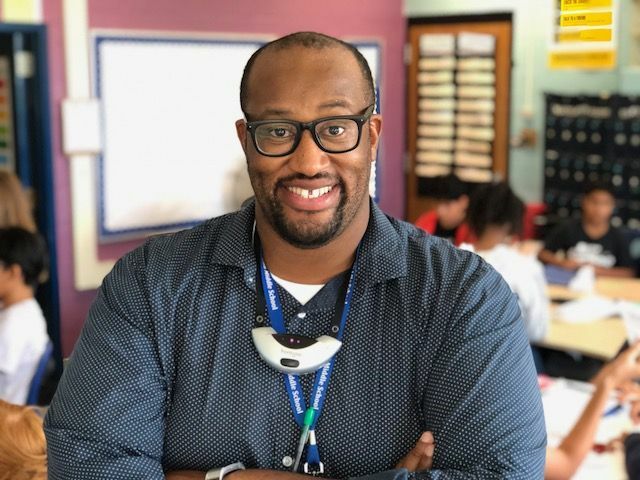 He attended Abbot Elementary and Forsythe Middle School, where his mom, Jacqueline Hogan, is a long-time teacher’s assistant. Hogan attended Eastern Michigan University and graduated in 2016 with his bachelor’s degree in mathematics with a secondary teaching certificate in math and communications. 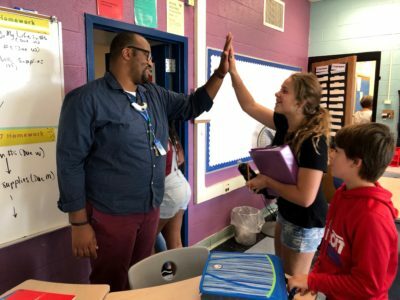 After student teaching in Ann Arbor at Clague Middle School, Hogan knew he wanted to contribute back to the community that contributed so much to him, and he accepted a teaching position at Tappan Middle School where he teaches math and coaches girls’ soccer, track and boys’ basketball. Hogan lives in Canton, Michigan, with his wife, Sarah, a high school English teacher. Principal Roberta Heyward says you have a very positive way of building relationships with all students. What are your tips for making that happen? Does it just come naturally to you? When I tell my students this, they swear that I am lying, but I am a huge introvert. I’ve really had to work to make those connections and build those relationships. I work so hard at it because we all know how important relationships are. Positive relationships are the best classroom management tool that I have in my repertoire. Cliff Notes version: Be real, celebrate effort, take time to have conversations and remember them! Go to their activities, and give a ton of high fives! What was always written on your report card in grade school? Haha… I think that I was a pretty under-the-radar student, so I’d say: kind, helpful, quiet, sensitive. What is your fondest memory of attending middle school? I was super awkward and uncomfortable all the time in middle school (which is not much different than today actually…). I think that the moments that I remember were when I was noticed. I remember being invited to sit with a group at lunch, and I remember getting an award from my advisory teacher. Both of these moments are normal, everyday parts of a middle schooler’s experience, but they have been burned into my memory as moments that showed me that I belonged and mattered. Does the fact that you felt uncomfortable in middle school affect the way you teach or interact with students today? Most definitely. I remember the moments when someone helped me feel like I belong. I work to foster this environment for all of my students. In class, we affirm and celebrate each other. We do lots of laughing and working together. You will often find students eating lunch in my room, playing games and getting to know each other. All of this is so that each student knows they are an important part of our classroom community. What inspired you to become a teacher? My K-12 career was kind of a mixed bag. I had some awesome teachers who inspired me and invited me to wonder and question. I also had some experiences that were not great, especially in math. I grew up in a home where education and community were central, and I was always passionate about giving back. After volunteering in a special ed class while in high school, I caught the teaching bug. Why middle school? This is interesting because I never imagined myself teaching middle school. When I was placed in a middle school classroom for student teaching, I was so upset! Getting to see my cooperating teacher, Keisha Ferguson, in action showed me how amazing this age is. They so want to be mature and have deep conversation, while in the next breath they will wax poetic about SpongeBob. I think that middle schoolers are some of the coolest people on the planet! What’s the best compliment anyone could give you? I gave my students an end-of-year feedback form last year. One of my students said, “Mr. 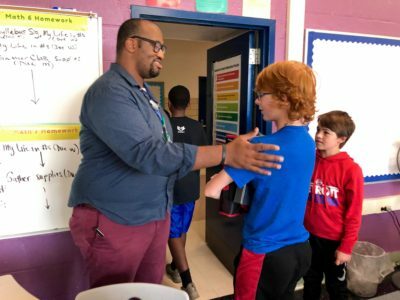 Hogan loved me and helped me become a better person.” This student had a few rough moments during the year, but what able to recognize that through it all, I truly do care and want what’s best for them. This was a huge compliment. What’s the most important thing you’ve learned about teaching? About learning? In my two years in AAPS, I have learned that teaching is really hard. There are so many things that are thrown at you every minute or every day, that it can be overwhelming. I also have learned that it is exponentially easier when you don’t do it alone. Describe an average workday. I try to get to my classroom by 7 each morning. I like the calm (and open copiers). I teach straight through until 2:10. I try to catch up on emails and set up my classroom for the next day during that last hour. After school, I am usually coaching a sport, hosting a club, or working with a group of students. When I get home, I try and relax for an hour, then I reflect on the day, grade papers, develop future lessons, and work on ongoing projects. This usually takes me to bedtime which is (fingers crossed) 11. What advice would you give to a first-year teacher? Ask questions, seek out positive mentors, reflect, find the joy every day, be kind (especially to yourself). What gadgets, apps, tools or websites can’t you live without: My calendar app! If it is not on the calendar, it doesn’t happen. It’s obvious that you keep your students engaged. How do you do it? I believe that learning should be fun, and I work to incorporate as much of it in my classroom (and life) every day! There is lots of music (and dancing) in my classroom. I also work to tap into the passions and interests of my students. This usually involves solving some worthwhile problem. Working on and solving problems that impact the lives in our community has had a tremendous impact on student engagement in my classroom. 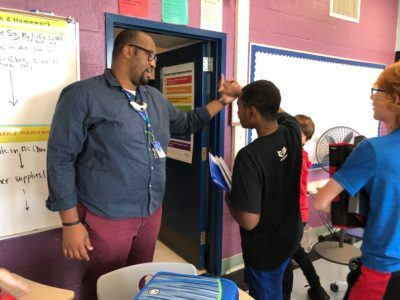 Lastly, I think that students are more apt to stay engaged with people they like, so I work hard to build and develop relationships with all of my students. How do you show school spirit? I enjoy going to school activities. I can often be found in the audience for music performances, in the stands for sports games, or in the halls during Fun Nights. It’s always cool to see students participate in something they are passionate about. What is the most rewarding part of teaching? Seeing my students grow as mathematicians and as humans. What do you wish everyone realized about the work of a teacher? I recently had someone comment to me that my job was easy because I only worked from 8-3. This false narrative, that teachers jobs are easy and luxurious, has led to a devaluation of the profession. 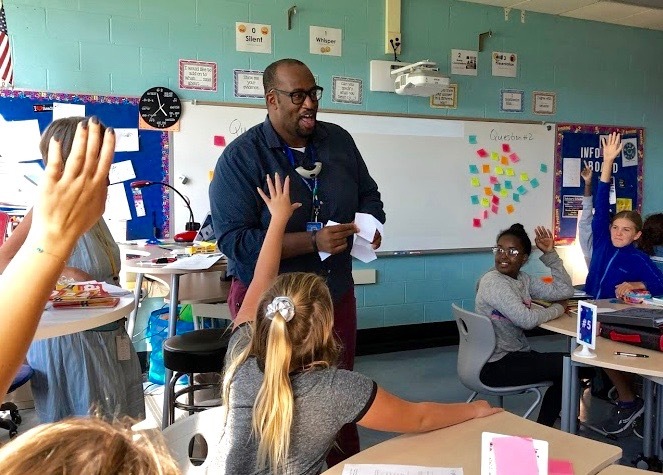 Teaching is an all-encompassing vocation, filled with passionate individuals that frequently work multiple jobs to ensure they can take care of their families while working tirelessly to give their best to others. We go in early, stay late, pay to learn new techniques, attend events, and grade at home—all so that we can make a difference in the lives of those that we are entrusted with. The physical and mental toll is great. How do you recharge? I read, read, read, and read some more. I also take drives with my love. How do you spend your summers? I teach summer school. It provides me a chance to return to my high school roots. We usually try to take a vacation or two as well. Stephan Hogan and his wife also devoted time to students at the church we attended. My granddaughter loved them both. He is sincere, motivated by genuine love and is so kind. This school is blessed to have someone of his character on staff. Stephan Hogan is the best math teacher my kids have ever had! He is fun, supportive and truly cares. He actually wrote a note to them their first day of school the NEXT year to wish them well, boost their confidence and let them know he is there to help. Great, great teacher!! We were so lucky to have him, and we’re so glad you honored him here. Mr Hogan is awesome I had him for a teacher and he never lost his temper. When you come into the classroom, the first thing you see is a funny meme, and personally i live on memes, so thats awesome. I’m glad I got a chance to have him as a teacher. Stephan is an amazing teacher! He is so devoted to our youth. Stephan is committed and has the energy to run this race as a middle school teacher. I pray that he stays the course and we continue to inherit his expertise and energy! He is a wonderful teacher .